Cover girl is not what I ever anticipated would be on my resume. Yet mindfulness I know is always a lead story when it comes to healthy, happy vegan living. 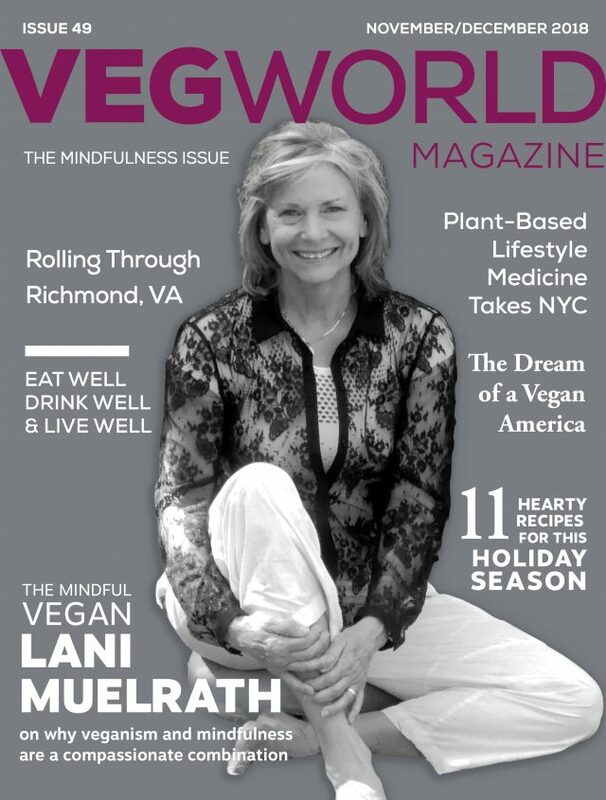 So when the new ownership of VegWorld Magazine approached me about their upcoming mindfulness issue – the first issue of the new ownership – and asked yours truly to be lead feature with their fresh look and content, there was no way I could say anything but yes. Due for release November 1, 2018, (the cover has just been finalized, image right) I couldn’t wait another minute to share. Mindfulness practice and vegan living have delivered untold freedom, happiness, and joy to me personally, and the only thing better is sharing this simple tools and perspectives with an ever expanding circle. Thank you for this stroke of brilliance, VegWorld Magazine – leading with mindfulness and veganism right out of the gate with your first issue under new ownership! In addition to the photo cover, this issue contains a robust piece I wrote for the feature article that I think you will enjoy. It is titled “Is Mindfulness The MIssing Link?” Between you and me, this is what the VegWorld Magazine‘s article editor wrote to me after receiving my first draft. I share it with you here because as an author, this is the kind of connection we dream of making with our readers. Well, Lani. I’ll be honest with you. I don’t know if I should publish this or simply save this little gem for JUST ME and allow it to make me the most wise person on the planet. This is lovely – honestly, just the kind of content we need for this really special issue. I will give myself a big pat on the back that I knew who to go to (i.e. 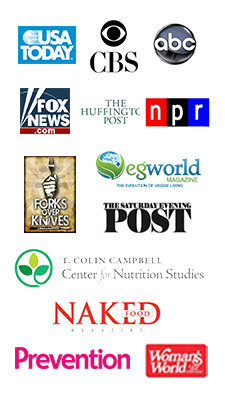 YOU) to help us out with this important edition of VegWorld. 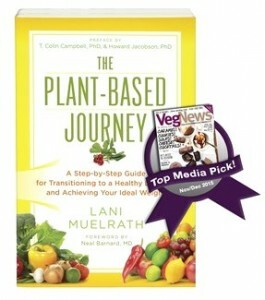 The writing reminds me so much of the accessibility and wisdom in The Plant-Based Journey. 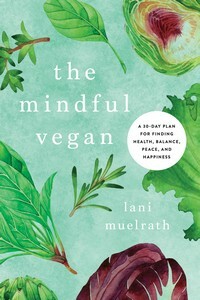 And The Mindful Vegan. It takes real skill to make complicated things easy. And you’re doing that here because — goodness knows – there’s nothing more frustrating (yes….wondrous, beautiful, miraculous – BUT frustrating) than the human mind and learning how to tame and use it effectively. And here, a short excerpt from the actual article. Just a sentence, really. We can know all the right things to do for living better – yet when it comes to following through, how is it that we can find ourselves derailed by the same old habits? Habits that frustrate our attempts to live more consciously, spiraling us into misery of body and mind? P.S. With launch of VegWorld Magazine under new ownership, the owners have extended to me a special offer to extend to you, the readers of the mindful vegan blog. VegWorld Magazine is digital, comes out every other month, and the usual price is $24.99. For you, ONLY $5 for subscription. 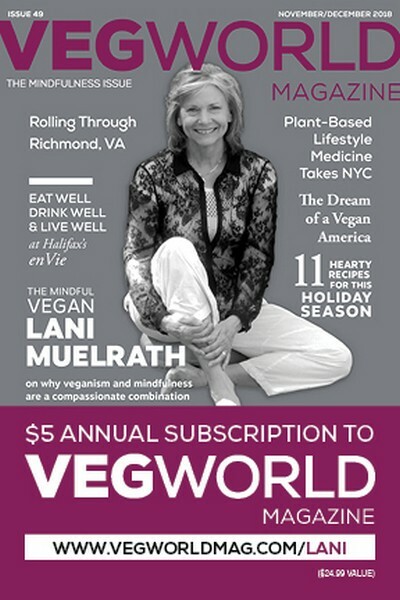 With special code (and I don’t make any $$ off this, it’s a gift) www.vegworldmag.com/LANI, (click for link) the annual subscription is just $5. Heavens! I like you am so glad to see this new area – well, actually it is something that has been around along time, as you say, just not uppermost in the veg world – come to light in this new edition of the magazine. I just subscribed and can’t wait to see the new issue with you on the cover! Fine work, keep moving the message forward, please! You look beautiful as always. Way to go….